Open Air Concert Hall – From SpongePedia, the biggest SpongeBob-wiki in the world! 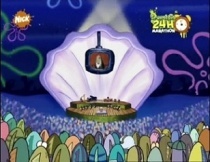 The Open Air Concert Hall appeared in the episode Suction Cup Symphony. It looks like it is built inside a giant clam, in which you can watch shows, sometimes a symphony and (possibly) plays. It has a seating capacity of 3,400. The first time it appeared, It was daytime and Squidward handed the manager of the symphony his original piece. During the performance of it, SpongeBob and Patrick appeared and did everything Squidward did. And the end of Squidward's symphony, the crowd cheered for him. The Conductor conducts it. This page was last modified on 7 August 2013, at 23:57.